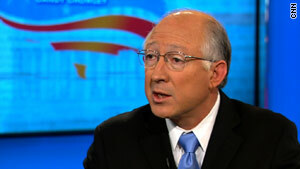 "I think we have to prepare for the worst," Ken Salazar said. Washington (CNN) -- Top federal officials said Sunday that the Gulf of Mexico oil spill is a potential catastrophe and defended the Obama administration's response so far. Appearing on CNN's "State of the Union," Homeland Security Secretary Janet Napolitano, Interior Secretary Ken Salazar and Coast Guard Commandant Adm. Thad Allen warned the leaking oil from a rig explosion could continue for weeks with dire consequences. Calling the spill "massive," Salazar blamed the explosion that caused it on a failure of technology in the rig intended to prevent so-called blowouts. Allen said it was impossible so far to know how much oil will eventually leak, saying: "We lost a total well head; it could be 100,000 barrels or more a day." "This spill, at this point in my view, is indeterminate," Allen said. "That makes it asymmetrical, anomalous and one of the most complex things we've ever dealt with." Capping the leak at its source 5,000 feet beneath the surface is the top priority, Allen said. However, the depth makes it impossible to send human crews, requiring the use of unmanned devices called remote operation vehicles, he said. "The first place we have to fight it is 5,000 feet down," Allen said. "That's where ultimately this is going to have to be fixed or a relief well ultimately is drilled." If the leak cannot be capped at the source, he said, the next step is to use dispersants and surface burning offshore, followed by coastal protection efforts such as the hundreds of thousands of feet of oil booms in use. The final step, if the slick reaches the shore, is a recovery effort in damaged areas, Allen said. Stopping the oil at the wetlands and other coastal areas was "not where we want to do this," Allen said. "We have to stop this oil where it's emanating on the sea floor." All three officials repeatedly emphasized that BP, the oil giant that owns the destroyed rig, is legally responsible for the spill and cleanup efforts. Asked if BP has responded properly, they avoided direct criticism, with Allen noting BP was deploying its top technology, such as the remote operation vehicles, which the government doesn't have. "That's exactly why from day one there were already deploying vessels and booms ... in case that scenario should result," Napolitano said. Salazar noted that the Obama administration has ordered inspections of "blowout preventers" on other Gulf rigs. The government's job was to "keep the boot on the neck of" BP to ensure it meets its obligations in stopping the spill, dealing with the oil slick and paying for all costs and damages. Also on the CNN program Sunday, Florida's Republican Senate candidate Marco Rubio called the oil slick a "crisis" but withheld judgment on the administration's response. According to Rubio, it appeared that much of the early information provided to the federal government by BP had been "either inaccurate or shortcoming." In recent days, Rubio said, "we've seen the administration move aggressively and I hope aggressively enough." CNN's Martina Stewart and Tom Cohen contributed to this story.